The knee is the largest, most complex joint in the body. It is also the most stressed. Knee replacement surgery involves replacing an injured or diseased joint with an implant to relieve pain and improve movement. When the knee joint is damaged, people can experience pain and decreased range of motion. This can make it difficult to perform daily tasks like standing, climbing stairs or walking. In cases like these, a doctor may recommend knee replacement surgery, also known as arthroplasty, which involves replacing the damaged weight-bearing parts of the knee joint with an artificial implant called a prosthesis. The first knee replacement surgery was done in 1968. Since then, more advanced surgical techniques and implants have made this surgery one of the most successful and common procedures in medicine. More than 600,000 knee replacements are performed each year in the U.S., according to the American Academy of Orthopaedic Surgeons. There are several reasons why someone might need to have knee replacement surgery. The most common reason is arthritis that damages the cartilage and bones in the joint. Age-related wear and tear on the knee joint and usually occurs in people older than 50. Causes the immune system to attack the membranes in the knee and creates damage and cartilage wear. Results from a serious knee injury (fracture, ligament damage, meniscus tear). This weakens the joint. A condition that affects teenagers and young adults. The bones in the knee become soft, causing the bone and cartilage to wear down. This usually resolves during adulthood, but in some cases the wear on the bone is extensive and arthritis sets in. Sometimes called being “knock-kneed” or “bow-legged,” creates high stress on the joint and causes abnormal wear. While the majority of people experience an improvement in range of motion and quality of life from knee replacement surgery, some people may experience complications such as infection or loosening of the implant. Knee replacement surgery can involve one or more damaged knee surfaces. Articular cartilage lines the femur and patella, cushioning the joint. Between the femur and tibia is the meniscus, a piece of cartilage that consists of two c-shaped pads (menisci) that absorb shock in the joint. If any of these parts become damaged or worn, moving the knee becomes painful and difficult. 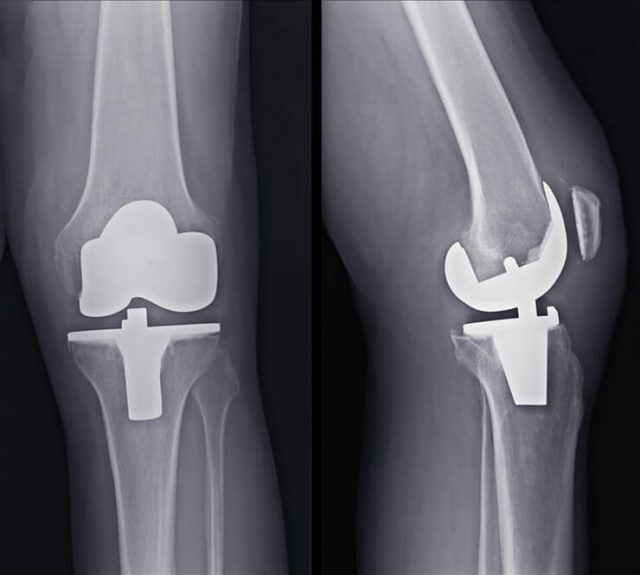 Knee replacement surgery creates new surfaces on the bones using metal components and replaces cartilage with smooth plastic. For this reason, some doctors may refer to the procedure as a knee “resurfacing” because only the surfaces of the bones are replaced. In some cases, the bone may be too damaged for the surgeon to spare. The damaged bone is then cut and replaced. Extra bone may also need to be cut to fit specific implant models. Before deciding on surgery, the orthopaedic surgeon evaluates the potential candidate’s medical history, general health and stability as well as the knee’s motion. The doctor will also perform an X-ray or MRI to determine the condition of the ligaments, cartilage and bone in the joint. If the person is a candidate for surgery, the doctor will also explain all of the different surgical procedures, including their risks, benefits and potential disadvantages. Knee replacement surgery usually takes about two hours, and general anesthesia is used. In some cases, the surgeon may use a robotic arm system that can help more accurately determine the damaged area and align the implants. This type of surgery is called computer-assisted surgery (CAS). Surgeons can obtain a 3-D model of the patient’s joint that allows them to align the implant more accurately. There are several types of knee replacement devices (prostheses), including total implants and partial implants. Depending on the patient’s age, weight and activity level, the model will vary. Doctors recommend a partial or total knee replacement surgery depending on the number of surfaces that are damaged. A specific model of prosthetic may also be recommended depending on the amount of damaged bone and cartilage that needs to be replaced. A doctor usually recommends total knee replacement surgery if all three of the joint’s compartments are damaged. This procedure replaces the end of the tibia, femur and the back side of the patella. During a total knee surgery, the surgeon makes an incision that is between 6 to 10 inches to expose the knee joint. The bottom of the femur is resurfaced and fitted with a metal piece (femoral head). Depending on the condition of the bone, the surgeon may have to cut more of the damaged bone off the femur. Next, a small piece of bone is cut from the top of the tibia and a flat, weight-bearing metal piece is screwed into the top (tibial plate). Then, a flat piece of medical-grade plastic (menisci replacement plate) is placed between these two pieces to absorb shock and allow the knee to glide smoothly. The back side of the patella facing the end of the femur is also resurfaced and fitted with a small plastic button. Damaged cartilage is removed at the ends of the femur and tibia, along with a small amount of bone. Damaged bone surfaces are replaced with metal components, and cartilage is replaced by medical-grade plastic. Depending on the case, some surgeons may resurface the underside of the patella (kneecap) with a plastic disk. A piece of smooth, medical-grade plastic is placed in between the metal parts to facilitate ease of movement. Some medical centers perform minimally invasive surgery for a total knee replacement, also called min-incision joint replacement. While a traditional total knee replacement requires an incision up to 10 inches long, minimally invasive total knee replacements require an approximately 4-inch incision. This surgery allows surgeons to cut less muscle and tissue, which leads to less blood loss, increased range of motion and a shorter hospital stay. Many patients go home the same day and the recovery process is usually much quicker than traditional total knee surgery. However, minimally invasive knee replacement is not for everyone. In general, the best candidates for this kind of surgery are younger and in better health. Older patients, those who are overweight (which can add extra stress on the joint) or patients who have undergone knee surgeries in the past may be less suitable for minimal incision procedures. Because it uses a much smaller incision, minimally invasive knee replacements have a higher risk for poor implant placement compared to traditional total knee surgery. Other common complications include nerve and artery injuries, wound healing problems and infection. Only specialized medical centers typically offer this surgical option. An orthopaedic surgeon should explain the complete process, the benefits and the potential risks to help the patient decide which surgical option is the best fit. With a partial knee replacement, the doctor only resurfaces one or two compartments of the knee. This alternative to a total knee replacement is limited to patients whose condition is limited to just one area of the knee. The surgeon spares as much of the healthy tissue and bone as possible. This may help regain range of motion, encourage more natural function and decrease healing time. However, the other parts of the knee may become arthritic at a later date, and another surgery to resurface those portions of the knee might be required. Additionally, partial knee replacement may result in slightly less predictable pain relief compared to a total knee replacement. Replaces one side (compartment) of the knee with metal and plastic. The healthy cartilage and bone, as well as all of the ligaments, are preserved. Replaces both sides (medial and lateral) of the knee, while leaving the lateral bone areas and cartilage intact. Replaces the end of the thigh bone with a metal piece and resurfaces the back of the patella (kneecap). Each of these procedures requires a different prosthesis and surgical technique. The incision for a partial knee replacement is much smaller than for a total knee replacement — usually only about 3 to 4 inches. After making the incision, the surgeon first makes sure that the damage can be corrected with a partial procedure. If that’s the case, the damaged parts of the bone are then capped with metal pieces, and a plastic piece is inserted between the two metal components. After the procedure, the patient can expect to be given antibiotics for about a day after surgery and medication (anticoagulants) to control pain and prevent blood clots. A drain to stop fluid from building up around the knee may be inserted. Some people may have a urinary catheter to minimize the need to stand after the procedure. To help retain flexibility and range of motion, some surgeons recommend a continuous passive motion machine (CPM) that slowly bends and straightens the knee joint while keeping it supported. While each individual is different, short-term recovery is usually between 2 and 3 months. After this time, people can typically walk without an aid or use over-the-counter pain medications instead of stronger prescription medications. Long-term recovery takes about six to 12 months. For most people, the knee is sufficiently healed after long-term recovery, and they can resume normal activities. The time it takes to recover enough to return to work depends on the individual and their job. A person who works in an office and spends most of their day sitting at a desk can probably return to work sooner. If the job is more physically demanding, doctors may recommend more healing time before returning to work. Managing knee pain following surgery is important for a good recovery, and doctors will give advice on controlling and living with any discomfort. Recovery also involves physical therapy and a home exercise routine to strengthen the joint and ensure that the knee’s range of motion is as good as it can be. Rehabilitation after surgery will likely last several months. After recovery, some people may notice that their new joint is not as flexible as their old knee. This is normal because an implanted joint is not as flexible as a healthy knee joint. Some of the factors that influence range of motion after surgery include age and how flexible the joint was prior to the operation. Just like any surgical procedure, knee replacement surgery can have complications. Complications are more likely to occur when having a total knee replacement than a partial knee replacement. Some of these complications occur because of the surgery itself. Others occur because of a faulty implant. If the person has a chronic illness, the risk of complications increases. For example, a person with sleep apnea — a sleep disorder that causes a person to have pauses in breathing while asleep — has a higher in-hospital mortality risk following joint replacement surgery. If the person has revision surgery — a second surgery required to adjust or replace an implant if it fails — the risk of complications increases. More serious complications, like joint infection, occur in less than 2 percent of patients. Infection is considered one of the most serious complications that can occur after surgery. When organisms enter the wound during surgery, they can attach to the prosthesis and are difficult to kill with antibiotics. Symptoms of early joint infection include pain and swelling in the joint, a leaking wound and fever. Depending on the type of bacteria, infections can be dealt with one of two ways: Debridement, washing out the infection, exchanging the plastic spacer and leaving the metal implants intact; and staged surgery, where the implant is completely removed. Other serious conditions such as heart attack or stroke are rare. Complications can also arise if the implant fails and causes loosening of the joint. This may require revision surgery to replace the original components. While today’s total knee replacement implants are designed to last 15 to 20 years or more, eventually prostheses break or wear down. In some cases, an implant may fail sooner than expected for a variety of reasons. This can lead to pain, swelling and difficulties performing everyday activities. In the event a knee replacement fails, the doctor may suggest a second surgery, called revision surgery. This corrective surgery is more complicated and difficult to perform than the original (primary) surgery and usually takes two to three hours to complete. By 2030, the demand for total knee revisions is projected to grow 601 percent from where the demand was in 2005, according to a study from Exponent Inc. published in The Journal of Bone and Joint Surgery. This procedure also takes more planning and special implants and tools are required. The implants used in revision surgery have thicker, longer stems to provide more stability and compensate for weaker ligaments and increased bone loss. According to the International Survey of Primary and Revision Total Knee Replacement, the U.S. has an 8.3 percent national revision burden, defined as the fraction of revision surgeries among all primary and revision total knee replacements. This means that of the 600,000 annual knee replacements, over 90 percent of patients experience a favorable outcome. Implants can fail because of a patient’s active lifestyle or because of normal wear and tear. Patients who receive a new knee when they are young and active will require revision surgery at some point, often sooner than 15 years. However, implants can also fail because of a faulty design that causes loosening and abnormal wear. 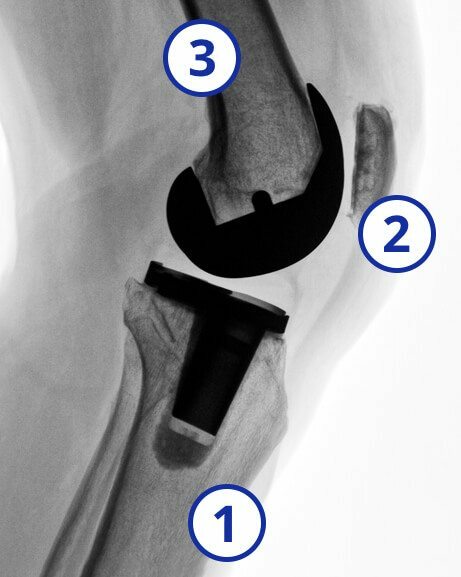 Some uncemented knee implants are designed for the bone to “grow” into the space and prevent loosening. Because of poor design, the bone may not fuse properly with the implant and loosening may occur. Loosening of the implant can cause pain and instability, which can lead to bone fractures. Sometimes the patella dislocates after surgery, especially a patella resurfaced with a plastic button. Typically occurs when the ligaments are damaged or improperly balanced during primary surgery. Because knee implants are regulated under the U.S. Food and Drug Administration’s (FDA) 510(k) clearances program, manufacturers are not required to conduct tests on them before releasing them to the public as long as they are similar to other products already on the market. As a result, surgeons and patients may be unaware that a device may not work properly until it has already been implanted. Knee replacement can be costly, but some studies suggest that the net benefit outweighs the cost of surgery. According to the American Academy of Orthopaedic Surgeons, the average cost for a knee replacement is $20,635. This includes all medical costs for surgery and rehabilitation. However, the organization estimates that this cost is offset by a lifetime societal net benefit of between $10,000 and $30,000. This originates from an estimated increase in income through a combination of increased probability of working and higher earnings. Revision surgery to remove a faulty implant can cost far more than primary knee replacement surgery. A 2010 study published in Clinical Medicine Insights: Arthritis and Musculoskeletal Disorders estimated costs of revision surgeries to be in excess of $49,000. Projected hospital costs for total knee revision surgeries are expected to exceed $2 billion by 2030. Because primary knee replacement surgeries are expected to grow to 3.48 million procedures annually by 2030, revision surgery is also expected to grow by 601 percent. Knee replacement surgery may be necessary in certain cases. But patients should speak with their doctors about alternatives to knee replacement surgery. Reducing weight can reduce the wear and tear on the knee. Losing one pound relieves as much as five pounds of stress on the knee. Muscles absorb stress on the knee. Building muscle can reduce knee pain. Physical therapists help shape a routine to best build muscle. Heating, cooling and other therapies can reduce knee pain. Over-the-counter versions of Tylenol can reduce pain. Drugs like Motrin, Advil and Aleve can reduce inflammation as well. Stronger prescription versions are available. Cortisone shots in the knee can ease pain and inflammation. Hyaluronic acid derivatives (HADs) work as shock absorbers. HADs supplement naturally occurring synovial fluid in the knee. Knee arthritis causes people to lose this natural fluid. Minimally invasive surgery can remove damaged cartilage. Recovery is faster and less painful than knee replacement. This new procedure uses radio frequencies to “rewire the knee.” It blocks nerves that carry pain signals to the brain. Marketed as “Coolief,” it does not repair damage. It only blocks pain. Another new procedure. One version replaces damaged cartilage with new cartilage from a donor. This method is called Missouri Osteochondral Allograft Preservation System (MOPS). Researchers at the University of Missouri developed it. Another procedure uses healthy cartilage from the patient’s own body. It moves pieces of the healthy cartilage to damaged knee. This procedure is called MACI, or Matrix-induced autologous chondrocyte implantation.